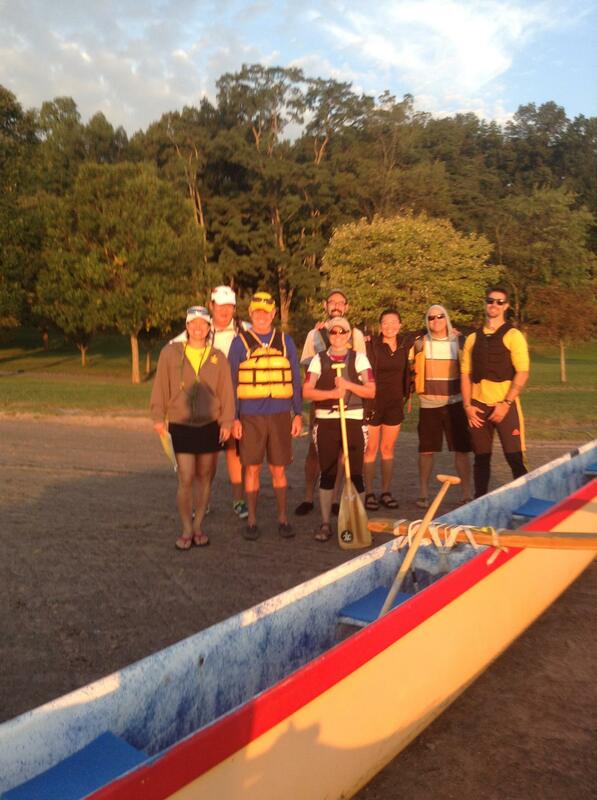 Cayuga Outrigger Canoe Club » Can You Canoe Cayuga? Can you canoe Cayuga? Apparently not quite yet. But we definitely had a great time! 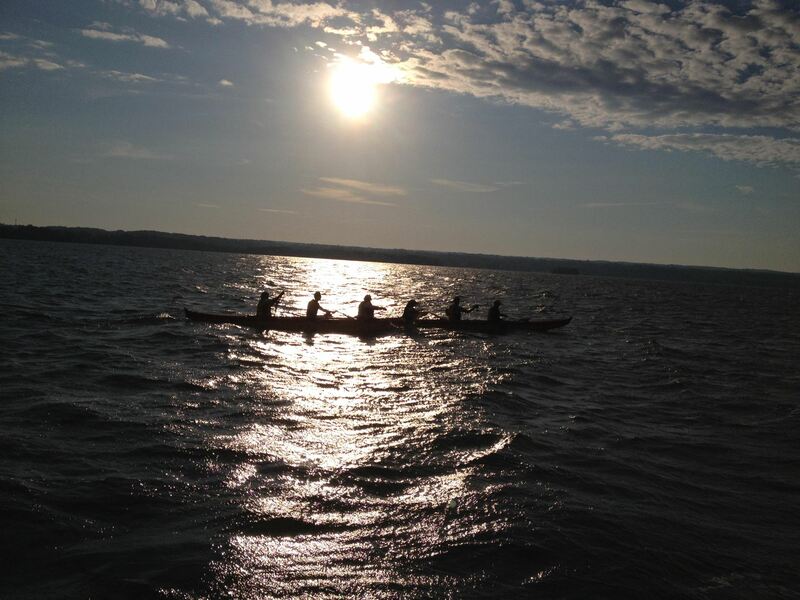 For the second year in a row, Cayuga Outrigger Canoe Club and a large group of kayakers and canoers, gathered along the western shores of Cayuga Lake to attempt to paddle the length of the lake. For the fourth year in a row, the lake got fiesty! After a beautiful Friday–a becalmed lake sighed under the gentle caresses of an autumnal sun–which saw club members Cynthia, Karen, and Sally, along with Captain Vicki and first mate Christopher, tow our canoe up to the northern end of the lake, we all awoke to somewhat different conditions Saturday morning. 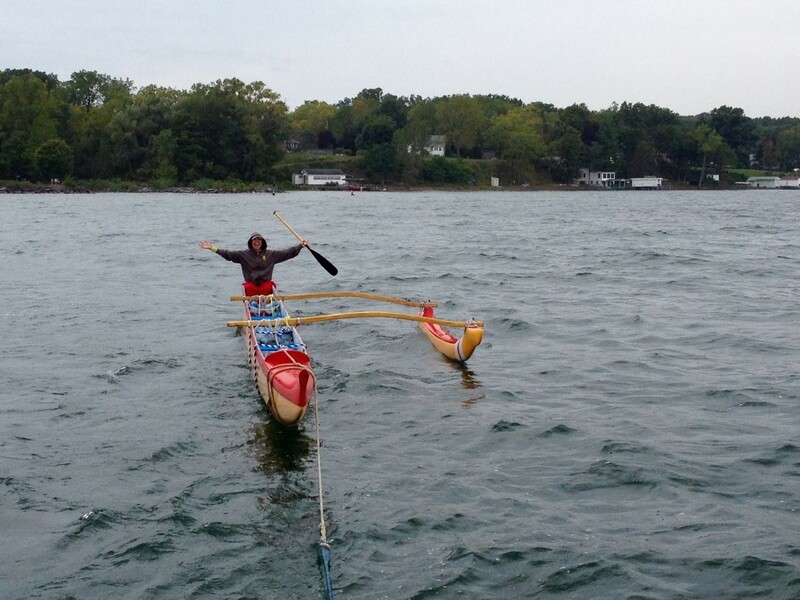 By then the organizers had already changed the starting point for the paddle, moving it eleven miles south from Seneca Falls to Dean’s Cove in the hopes that paddlers would be off the water in Cass Park prior to 2pm when the heavy winds were scheduled to descend. No such luck. By the time we arrived at Seneca Falls (not Deans Cove) at 6:45am (yes, AM! ), the flags were flappin’ and the waves were lappin’. We prepared ourselves for a vigorous and exciting day, Cynthia gave the opening prayer for a safe and wonderful day, and we set off with a crew of Skip, Nick, Karen, Nick, Scott and Ray steering. A new captain manned our chase boat: Captain Tom, whose playful banter, steady hand, and wafting cigarette smoke kept us all buoyed. We made good progress at the outset, heading to the channel in the middle of the lake to bypass the shallow and weedy shoreline. Doom awaited. Nearing the first protruding land mass (hereafter referred to as ‘the point’), the wind picked up intensity and the waves began to roll, moving from south to north. Swells, with occasional white-caps, were between 3 and 5 feet. We closed our eyes and imagined we were in Hawaii in January. Rounding the point, we started to take on quite a bit of water, at one point having to have two paddlers bail to clear the canoe of water. It made little difference as approximately 5 miles in we hulied…. for the first time. This was the worst of the three hulis. The canoe filled up so rapidly and the waves were relentless and big that we were unable to bail it out. Tom pulled the boat alongside the canoe where he stood in awe as Cynthia plunged in to the lake to rig the canoe to the side of the boat so that we could be towed to a location where we could actually bail. Seriously, Tom was like… “Daaamnnnn!” Once near shore, Cynthia got back on the boat to warm up while a number of us bailed and set out again. The waves persisted and the next point loomed. Doom awaited. We attempted to round the second point while still staying relatively close to shore but the waves were pushing from the southeast to the northwest. Every effort to hug the western shoreline was met with an agitated ‘ama. Now 6 miles in, we hulied again. This time we moved quickly to flip the canoe and managed to bail it prior to it filling with water. Less then 10 minutes later, we were off again. The waves kept coming and it was getting moshy, with gnarly stuff coming from all directions. Karen was way impressed by Ray’s steering and shouted some words of encouragement: “You’re doing a great job Ray!” And then we hulied for the third time. Once again we righted the canoe. Ray swapped out with Cynthia, Sue-Je was now in the canoe, and Nick J. swapped out with Nick W. but unfortunately Nick W. dislocated his shoulder and returned to the boat. While you might feel bad for Nick–and you should–do keep in mind his own words of wisdom: “At least it isn’t the Hudson where I come out feeling gross!” With Cynthia at the helm, the canoe headed in to the waves and toward Deans Cove. It was now 10:30am. We had been on the water for 3 1/2 hours and covered 8 miles. Ouch! Thankfully, the hulis came to an end. The crew did a great job of blasting across this section of the lake and to Dean’s Cove where Sally, who was awesome in supporting the crew and driving from checkpoint to checkpoint and keeping us organized, awaited. Skip met his family here and headed off. The rest of us discussed whether we should continue but word from Sally and others was that the lake was getting intense and the weather forecast looked gloomy. We were pretty beat and it was approaching noon. We decided to tow the canoe to Sheldrake and then Taughannock to see if we could paddle from one of those locales. Yet again the point at Sheldrake was messy and unpleasant but as we approached Taughannock the weather began to ease and we briefly considered paddling the last stretch from Taughannock to East Shore. Briefly considered…. We towed the canoe to east shore and then headed to Cass Park to help Tom with the boat. By that point, it was past 5pm. We ended the day–or some of us did–at Ray and Cynthia’s house with kalua pig, lomi lomi salmon, and squid luau, as well as a variety of beers. It may be the case that this annual event will come to be known as Can You Sink Your Canoe in Cayuga?…. but probably not. We are ready for next year! And even if it is gnarly again next year and we end up swimming a lot, it was great fun, memorable, and a day on (or in) Cayuga Lake is better than a day at home or work! Thanks to everyone: to the crew who came out and paddled hard and had a good sense of humor; to Vicki and Tom for the boat and for taking good care of us; for Sally for being our shore person and coordinator; and a big hand especially to Cynthia who organizes this every year, made amazing shirts for the event, and refuses to let the weather dampen her spirits… and keeps us all going!